Free the members of the Coordinating Committee arrested in City of Karaj! 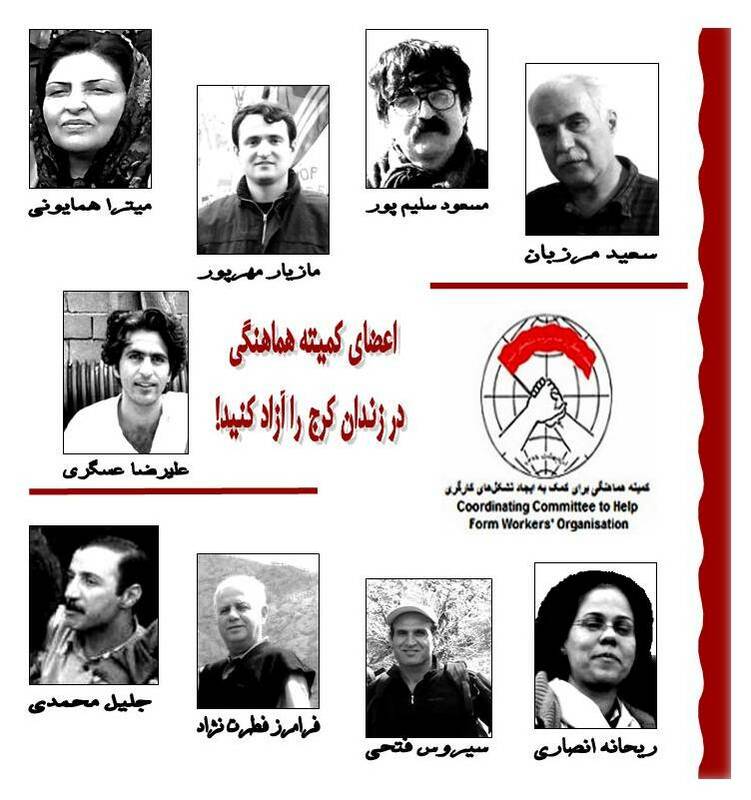 As we have mentioned in earlier announcements, on Friday 15th of June 2012, a group of members of the `Coordinating Committee to Help Form Workers' organizations´ in the city of Karaj were attacked by security forces. These workers and labor activists were beaten by armed security guards while holding our annual general meeting. According to the latest news most of those arrested have been released, but Cyrus Fathi, Alireza Asgari, Jalil Mohammadi, Saeed Marzban, Masoud salimpour, Maziar Mehrpour, Reyhaneh Ansari, Faramarz Fetradnejad and Mitra Homayooni are still in detention in Karaj City Prison. Although this is not the first time that members of the Coordinating Committee were being arrested, as in recent years many of our members in different cities have been detained and convicted for defending workers’ rights- our members have been sentenced to prison, fined and flogged numerous times in the past. However, what happened last Friday, while residents of the neighborhood were witnessing, was an assault by armed security and intelligence forces on workers, which included beating and opening fire in the air, all of which without providing an official order. This happened while workers were discussing problems facing them and the working class as a whole. The beatings were so severe that some of them as: Mohammad Molanai, Hasan Ezati, Rahman Ebrahim-Zadeh, Ghaleb Hosseini, Khaled Hosseini and Nezam Sadegi are still suffering from injury and soreness.